Around the world, the only way to make germy water safe is through a boiling process, which uses a lot of fuel. Another method to make water germ-free is leaving it in a plastic bottle that is exposed in the sun, which allows the ultraviolet rays to kill the microbes. The UV process goes on for six to 48 hours as UV rays only carry 4% of the sun’s total energy, limiting the volume of water that can be disinfected by the individuals in this manner. A nanostructured device has recently been developed by researchers at the Department of Energy’s SLAC National Accelerator Laboratory and Stanford University. This device is half the size of a postage stamp and is capable of disinfecting water faster than the UV method. The device also uses the visible part of the solar spectrum, which has 50% of the sun’s energy. 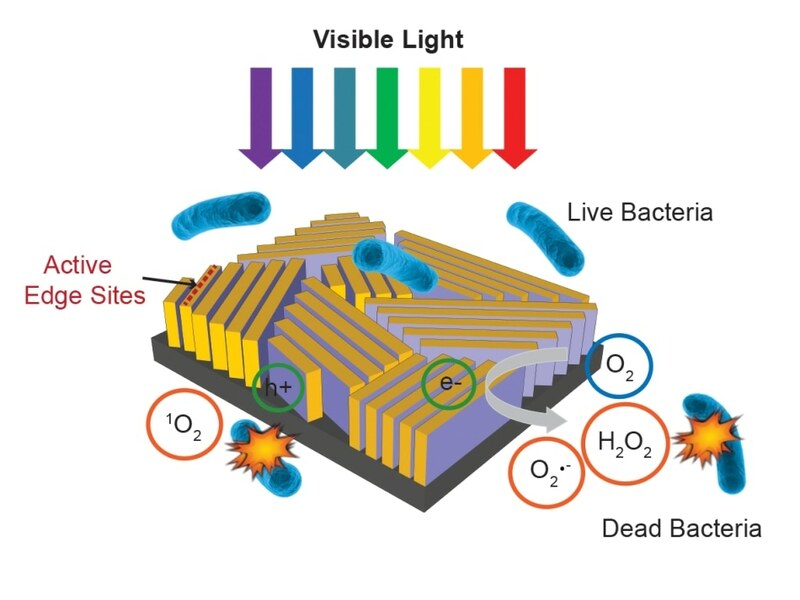 Nature Nanotechnology features experiments where sunlight falling on the small device prompted the development of hydrogen peroxide and various other disinfecting chemicals that eliminated more than 99.999% of bacteria within a period of 20 minutes. After completing the work, the killer chemicals rapidly dissipated leaving behind pure water. Our device looks like a little rectangle of black glass. We just dropped it into the water and put everything under the sun, and the sun did all the work. Liu is a postdoctoral researcher in the laboratory of Yi Cui, a SLAC/Stanford associate professor and investigator with SIMES, the Stanford Institute for Materials and Energy Science at SLAC. The surface of the device, when placed under an electron microscope, resembles a fingerprint comprising a number of spaced lines. These extremely thin films - or nanoflakes - are made from molybdenum disulfide stacked on the edge just like the walls of a labyrinth, atop a rectangle of glass. When struck by incoming light, most of its electrons leave their standard places, and both the electrons and the holes left behind by them are eager to take part in chemical reactions. The scientists developed the molybdenum disulfide walls with appropriate thickness and allowed them to absorb a complete range of visible sunlight. They then topped each tiny wall with a thin copper layer, which also behaves as a catalyst. By doing this, the scientists were able to use sunlight to carry out the exact reactions they wanted. These reactions develop reactive oxygen species like hydrogen peroxide, which is a disinfectant generally used to kill bacteria present in the surrounding water. Molybdenum disulfide is easy to produce and cost-effective. These two features should be considered when developing devices for extensive use in developing countries, Cui stated. Molybdenum disulfide is also capable of absorbing a wide variety of solar wavelengths than standard photocatalysts. The technique is not a cure-all because it does not remove chemical pollutants from water. It has only been tested on three strains of bacteria, even though there is no reason to assume that it would not kill other strains of bacteria and various other types of microbes like viruses. The technique has only been tested on bacteria mixed with water in the lab, and not on the complicated stews of contaminants present in the real world. It’s very exciting to see that by just designing a material you can achieve a good performance. It really works. Our intention is to solve environmental pollution problems so people can live better. The work received financial aid from the Department of Energy Office of Science through SIMES. It was executed in collaboration with Professor Alexandria Boehm’s group in the Stanford department of civil and environmental engineering.